As the flower garden slows down for the year, the door opens for next year. 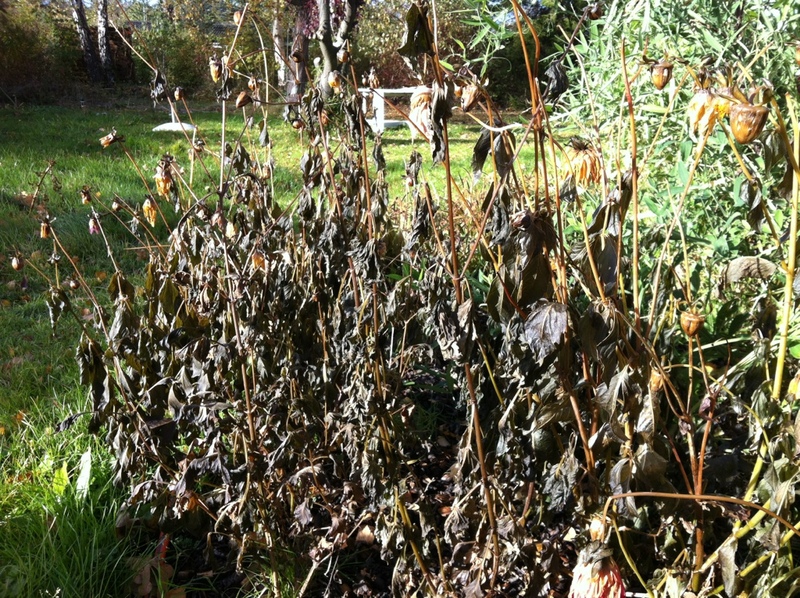 Now is the time save plants for next year, plant for spring, and let winter help you out with the hard work. When dahlias blacken with the first frost cut back the foliage, then lift the tubers, clean and trim off the thin long roots. Stand them upside down to make sure they’re dry before storing them away in dry compost, or wrapped in newspaper. There is still time to buy and plant spring flowing bulbs. Choose your supplier carefully and you’ll get quality and a bargain to boot; wholesale suppliers are already reducing prices on remaining stock. My favourite is Gee Tee (gee-tee.co.uk), I’ve used them for nearly 20 years. You can continue to plant bulbs into the first weeks of December. If your soil is heavier, get it turned before the frosts come. Just dig, lift and leave, and let the frosts break down the clods for you. As the temperatures drop these lumps will form a perfect growing medium, ideal for areas where you’ll be sowing seed – vegetable beds or borders for annuals. The dormant months – from leaf fall through spring budding – are also the perfect time to prune trees and shrubs. Christopher Lloyd maintained that the best time was when you had time and secateurs in your hand. And I agree, but the down side is that you may have to sacrifice the plant’s crop of flowers or fruit. Timely pruning will encourage flowers and fruit, create better shape and promote strong growth. Trees that will benefit most are those that will “bleed” if pruned when sap is flowing—including apples, pears and figs, acers, most deciduous ornamental trees, and vines including grapes and wisteria. Many roses can also be pruned when it gets cold, floribunda, hybrid tea and climbers. In fact if it’s not rambler, you can prune it in winter. Those ornamental deciduous shrubs that have doubled in size this year can be brought back into line while dormant. They’ll look like a skeleton for a few weeks, but will come back with better shape and vigour. The golden rules of pruning are the three D’s – dead, damaged and diseased – remove them all while creating an open and uncongested shape. For roses that is usually a “goblet”. With fruit trees Monty Don advocates the should be open enough that a pigeon can fly through. And if you need any extra guidance, the RHS website explains everything very clearly. Enjoy your garden this winter.